Two Brothers. Two Cities. One Healthy Competition. In conjunction with the Boys & Girls Clubs of America, Coach Pau and his Los Angeles team of kids challenged Coach Marc and his Memphis team of kids to see who could live a healthier summer through physical activity and healthy eating. Lasting from June 10th to August 2nd, this eight-week event was filled with fun physical activity, exercises in sportsmanship and leadership development, and healthy meal planning and preparation. 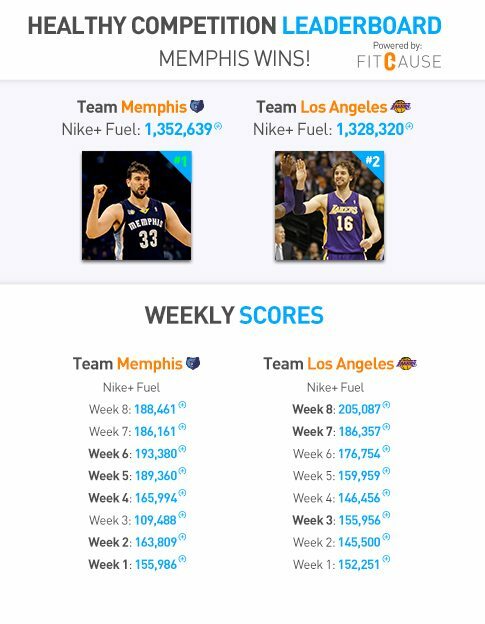 To launch the first annual Healthy Competition, throughout the summer Coach Pau and Coach Marc tracker their team’s physical activity progress via Nike FuelBand technology. The coaches rooted on their teams by sending regular motivational messages and tips to participating youth via online social media channels. To read more about these events, click here: Memphis & Los Angeles. After a heated competition, Memphis came out in front! To celebrate an incredible race, Marc and Pau plan to visit their respective Boys & Girls Club teams along with members of the Memphis Grizzlies and Los Angeles Lakers spirit squads. Prizes will be given to participating youth to recognize their outstanding achievement. Additionally, as the coach of the losing team, Pau has lost the brotherly bet and will be shaving his beard! To view pictures for the first annual Healthy Competition, click here: Memphis & Los Angeles.